We are excited to announce that the “I Have A Dream” Foundation has been selected to be featured in this year’s CBS Cares campaign, a national public service campaign. As part of the campaign, CBS has produced PSAs about the “I Have A Dream” Foundation that will be aired in every CBS market across the country, to an estimated audience of 100 million viewers. The campaign features celebrities from CBS programs, including Mayim Bialik (The Big Bang Theory), LL Cool J (NCIS: LA), Luis Guzmán (Code Black), Téa Leoni (Madam Secretary), Chi McBride (Hawaii Five-0), Shemar Moore (Criminal Minds), Jeff Probst (Survivor), Tom Selleck (Blue Bloods) and more. The campaign began in November 2015, and will continue through Spring 2016. We are also grateful to have had the opportunity to see our PSAs featuring Téa Leoni and Tom Selleck air during Super Bowl 50. A major goal of this campaign has been to triple our online and social reach. Please join our movement. You can like us on Facebook, and follow us on Twitter, Instagram, and LinkedIn. We encourage you to use the guide below to share the campaign. 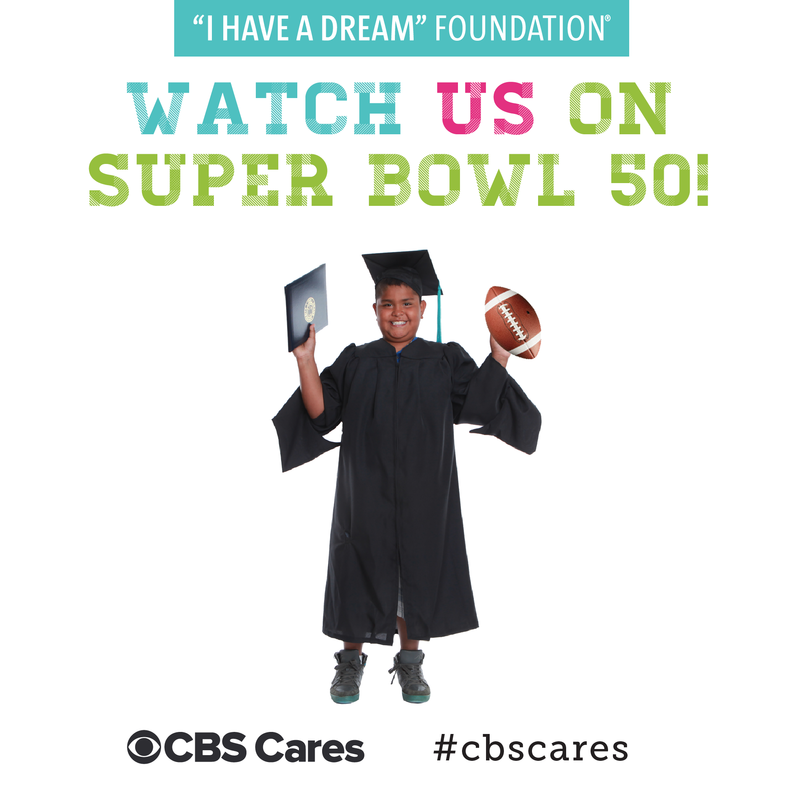 We look forward to using this tremendous opportunity to provide our Dreamers with more visibility, resources, and access to success and we are honored to be partnering with the entire CBS Cares team.
.@tealeoni stands up for educational equity with this new @cbscares PSA: http://bit.ly/1MlbMjM. “Dreamers” are nearly twice as likely to receive a Bachelor’s degree than their low-income peers, drastically improving a student’s ability to secure a good paying job after college. Approximately 90 percent of “Dreamers” graduate from high school or obtain a GED. Sixty-seven percent of Dreamers enroll in college. According to the U.S. Department of Education, research shows that just nine percent of students from low-income families receive a Bachelor’s degree. Due to the comprehensive support the IHDF offers to students from low-income families, “Dreamers” are nearly twice as likely to receive a Bachelor’s degree than their low-income peers. A new national study by the Southern Education Foundation shows that more than half of public school students are from low-income families, making IHDF’s work to support low-income students in their journey to receive a Bachelor’s degree more salient than ever. 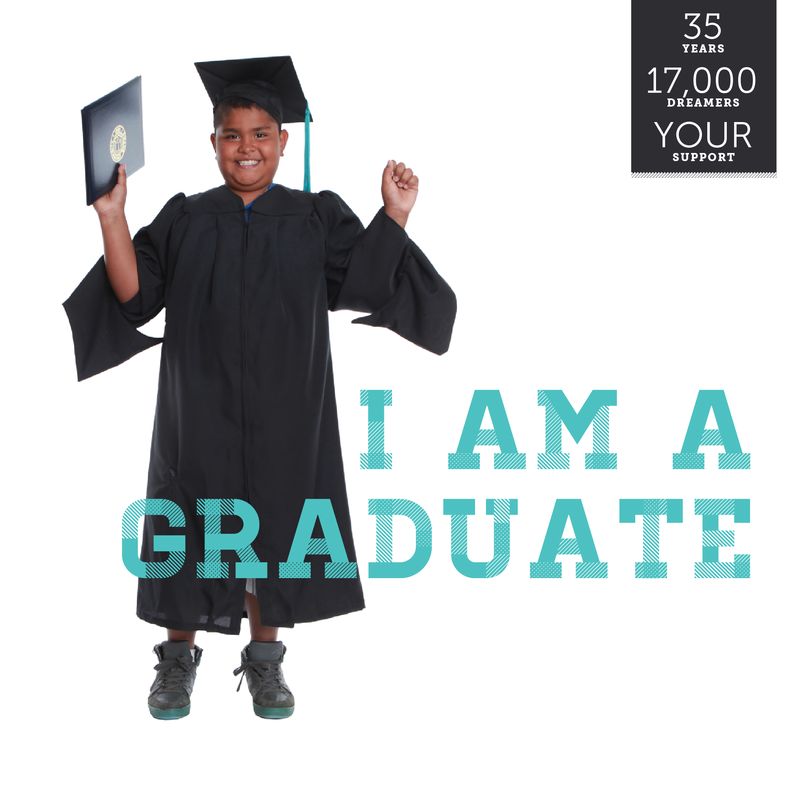 By helping students receive a Bachelor’s degree, IHDF breaks the cycle of intergenerational poverty. Research demonstrates that low-income students who never go on to receive a Bachelor’s degree are likely to remain in poverty. Since 1986, IHDF has helped nearly 17,000 Dreamers complete the IHDF program, putting the dream of a Bachelor’s degree squarely within the reach of thousands of students from low-income families across the country. 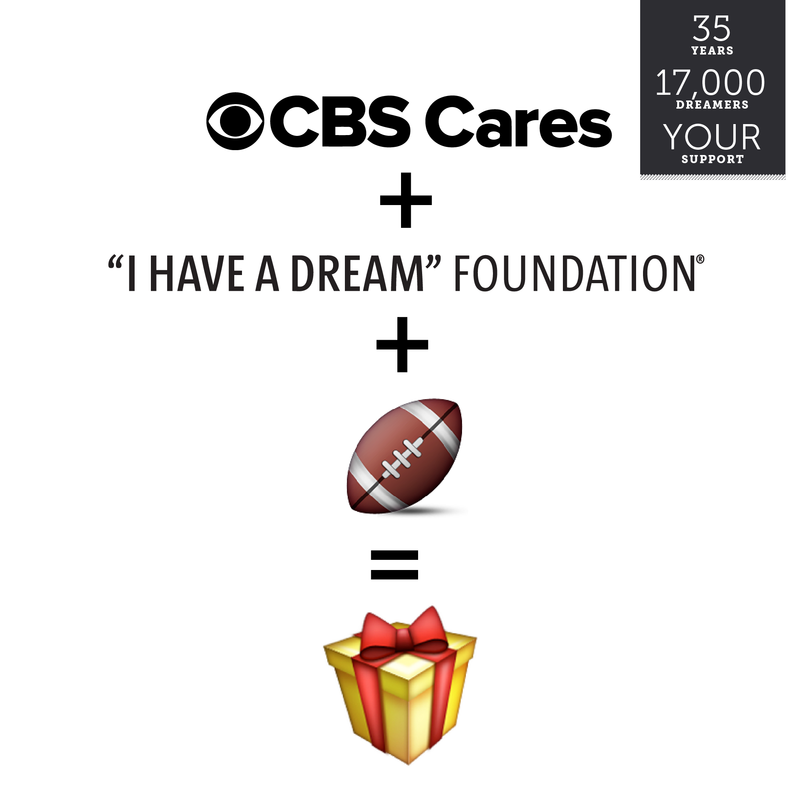 We are thrilled that CBS has chosen to feature the “I Have A Dream” Foundation in this holiday season’s CBS Cares public service announcement campaign. The PSAs start airing on the evening of November 27th and will reach between 70 and 100 million viewers and listeners, bringing much-needed and deserved attention to our unique focus of working to ensure higher-education opportunities for low-income students across the country. We are grateful to have talents like LL Cool J, Mayim Bialik, Luis Guzman, Jeff Probst, Shemar Moore, Tom Selleck, and Tea Leoni give their time to be featured in CBS Cares PSA campaign to support our foundation’s mission of putting the dream of a college education within reach for thousands of low-income students across the country. Viewers can support our work by making a donation on our website, “I Have A Dream” Foundation dot org. The “I Have A Dream” Foundation is a 35-year old nonprofit organization that uses education as the main lever to break the cycle of poverty. Currently we work in 16 different cities, working with over 4,000 students in the kindergarten through college age. We have over 16,000 alumni nationwide. Our programs follow the same group of children (“Dreamers”) from elementary school all the way through college. Our programs are unique in their comprehensiveness: we work with Dreamers after school, on the weekends, and over summers, to provide them with the academic, social-emotional, life skill, and college readiness supports they will need to succeed. 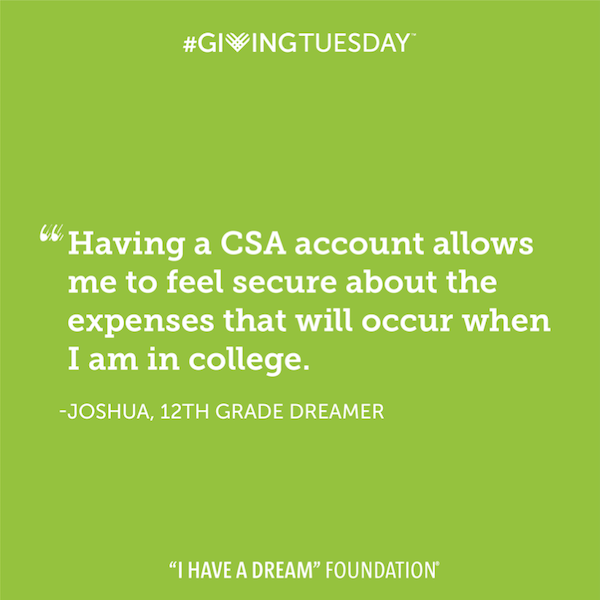 Once our Dreamers are ready for college, we provide them with guaranteed financial support for college expenses. “I Have A Dream” Foundation prides itself on its inclusive approach. Our model is to work with an entire community – in the classroom, school administration, and housing developments. IHDF engages funders, program partners, school districts, principals, teachers, public housing developments, government officials, and other stakeholders to determine the best areas throughout the country for our program. Our model reflects the current landscape for college financing: there are many financial resources, scholarships, and grant programs available to students, particularly those who have little income. IHDF provides direct financial support for postsecondary schooling, however, we focus considerable effort on connecting Dreamers to other, pre-existing financing opportunities. The “I Have A Dream” Foundation considers itself one movement and one family. We currently operate in 16 different locations around the country, each of which we refer to as an “affiliate.” Each affiliate, and the national office itself, is its own 501(c)3 organization, but we work very closely together to ensure the best possible outcomes for all of our Dreamers, regardless of location. The “I Have A Dream” Foundation takes our name from Martin Luther King, Jr.’s August 1963 speech, given to over 250,000 civil rights supporters at the steps of the Lincoln Memorial during the March on Washington for Jobs and Freedom. Our Founder and Chairman Emeritus, Mr. Eugene M. Lang, was present and inspired by the words of Dr. King, and later went out to found the foundation by sponsoring the graduating sixth grade class at his alma mater, Public School 121 in East Harlem. Mr. Lang decided to call the first students he worked with “Dreamers,” to embody the hope and aspirations of this generation, and to emphasize the importance of creating opportunities for all children, regardless of socioeconomic status. IHDF is proud of the fact that the vast majority of our expenses, historically and today, have been spent on programs and services (75% of expenses on programs, 25% split about evenly between management/general and fundraising). We are confident we will be able to retain our strong ratings from Charity Navigator, GuideStar, and the Better Business Bureau.